Amid the headlines of textile and apparel plant closings, there is an undercurrent of industry restructuring that suggests the emergence of a revitalized textile and apparel sector in South Carolina. In contrast to the textile and apparel industrial complex of the 1980s and 1990s, the textile and apparel cluster over the next decade is likely to have fewer low skilled laborers, and will pay higher wages and salaries in the industries that prosper. 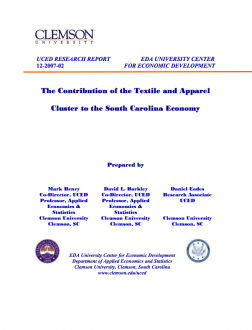 The purposes of the research report are to document the current contributions of the textile and apparel industrial cluster to the South Carolina economy, and to examine how the emerging textile and apparel cluster will impact the state economy over the next decade, if its component industries are able to compete effectively in domestic and World markets. It is well documented in the academic and popular press that the nation’s textile and apparel industries, as a whole, have experienced significant plant closings and employment losses in recent years. Explanations for the industries’ downturn in jobs are an increase in plant and worker productivity resulting from the adoption of new technologies, an expansion of textile and apparel production in developing economies with low wage labor, and an increase in global trade as a result of improvements in information and communication technologies and fewer trade restrictions. With the anticipated growth of global production and consumption of textilerelated products and services, there are opportunities and challenges for the South Carolina textile complex. 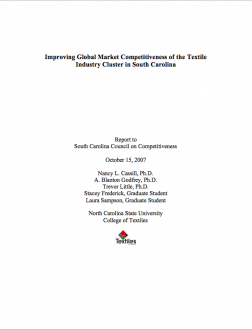 The purpose of this research study was to conduct an analyses of the textile complex in SouthCarolina, including a market analysis, segmentation of SouthCarolina companies (three categories), and identification of needed assistance for these companies. The global textile complex is undergoing a massive restructuring, and this restructuring is impacting the business dynamics of the SouthCarolina textile complex. 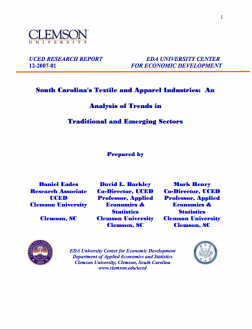 With South Carolina’s historical dominance in the global textile complex, the study’s outcomes can have significant impacts on the SouthCarolina textile complex, as well as the SouthCarolina economy.